I’m going to show you the growth of the two podcasts I’ve had over the last three years or so. This growth lesson basically applies across the board to whatever you’re trying to do. It doesn’t even have to be business related. It could be life related. This is my first podcast, Growth Everywhere. For Growth Everywhere, I was able to grow it from 0, no audience at all, and now we’re getting about close to 80,000 downloads a month. But it a was a long road there. I basically started in November of 2013 and I was getting about 10 downloads a day. So, the thing is, I spent a lot of time on this in the beginning. I had to put myself out there, do all these interviews, and reach out to people, which was pretty nerve wracking. 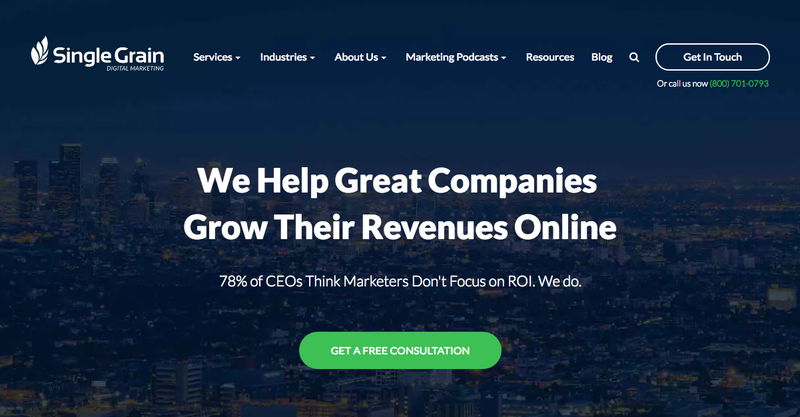 At the time, I just came into Single Grain, too, which is the digital marketing agency I now run. So there was a lot going on, and I decided to start this at the same time just because I thought I could give back and help the community. And I really wanted to talk with these smart people, ask them how they grew their businesses, so I could provide value to everybody else, too. I knew I could do “deep-dive” interviews with entrepreneurs, and really dig into how they were able to grow their businesses, and what their funnels looked like, and try to draw out these growth lessons, both business and personal. A year later, November 2014, we went from about 10 downloads a day to about a 172 (or 300 downloads a month to 4,500-5,000 downloads a month), which is not too shabby. That’s a 17X daily increase. I was putting a lot of time into it, so I knew that I probably needed to delegate this, but I still kept continuing on. I was basically doing one interview per week. I also added in short little segments called Growth Bites (screenshot of some episodes below) where I’ll talk for 5-10 minutes. Much like what I’m doing now with my Growth 90: Daily Live Broadcasts, but this is live, and this is going live to both YouTube and Facebook at the same time. Hopefully, we can go live to Instagram and Twitter soon, too. Now, jump ahead to 2015. We went from about 170 downloads in a day to about 327 a day. So, 10, 172, 327. The growth is still not that crazy. 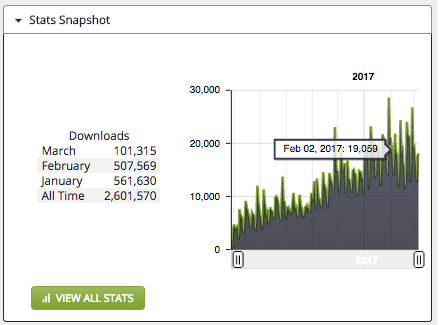 It took basically two years to get to about 9,000 downloads a month. Which is not too shabby, but just shows that it takes a lot of time. Just remember, when you invest in your business’ growth, it takes a long to time get there, but often times we expect to get there a lot faster. It’s just not the case. If we fast forward another year to 2016, then we’re getting about 1,900 a day (about 60,000 a month), and you can see we’re still growing. 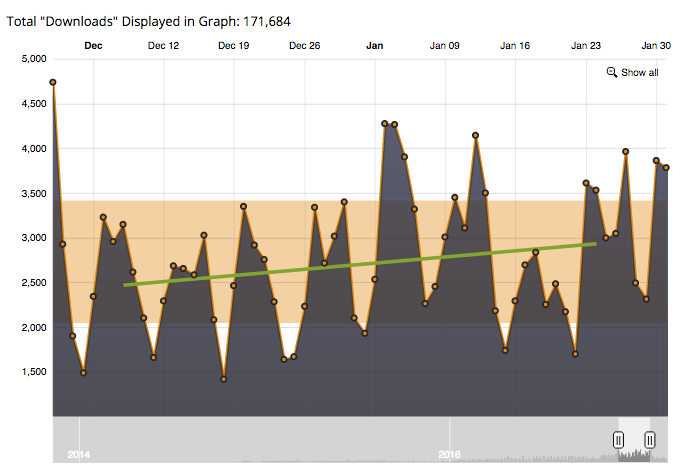 It took three years to get to 80,000 downloads a month. 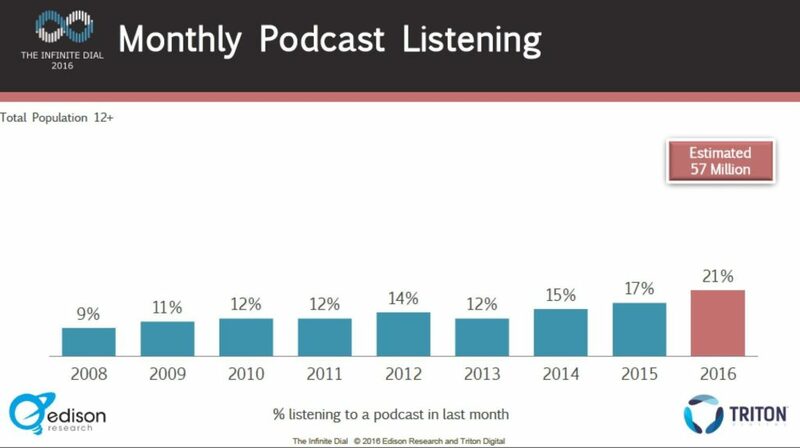 Just keep in mind, we have to put things in perspective here: Podcasts only have an audience of about 52 million people. Which is much smaller than the Facebooks of the world, and much smaller than the Snapchats of the world too. So, just keep that in mind. Key lesson here is that growth takes time. 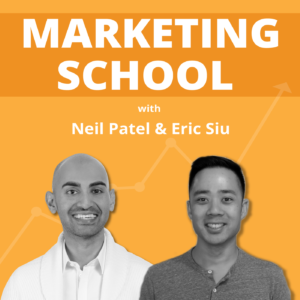 Doing this podcast basically led to my next podcast with Neil Patel, called Marketing School. I interviewed a lot of different people, but I wanted to nerd out on marketing, too, because it holds me accountable. So Neil and I started Marketing School in August of 2016, and right out of the gate we were getting about 4,000 downloads in a day. The reason for that was that I had already built a small audience, Neil had a huge audience because he’s been doing it for a very long time, and together we were able to grow it from 4,000 downloads a day to anywhere from 12,000-26,000 a day (about a half million downloads per month). We have some spikes here and there, but if you want one podcast tip, it would be to show all your episodes at once instead of just showing 100 (by default, iTunes caps you at a 100). Show everything, so that more people can discover your stuff. I’ve had people who will search iTunes and say, “Hey, is this you?” They literally found my podcast that way. I’ve had people stop me in the elevator, asking if I was that guy from one of the podcasts, too. That part’s great, but the best thing about doing all of this, or building an audience anywhere, is the e-mails you get from people saying, “Hey, I was able to find my first job. I had no degree, and this podcast basically helped me get my first marketing job.” Somebody else was like, “Hey, my partner and I we were doing zero in revenue, and all of a sudden we listen to your stuff, and implement some of the stuff, and we just made $75,000.” That stuff’s huge! That stuff validates what we’re doing. The branding aspect is good, too, because that’s one thing that nobody can take away from you, whether you’re trying to grow a podcast, whether you’re trying to grow some kind of Instagram channel, whatever it is. We’re going to see where podcasting takes us. We’re aiming for a couple hundred thousand for Growth Everywhere and a couple million for Marketing School. But it does take a lot of time and it is a big commitment. 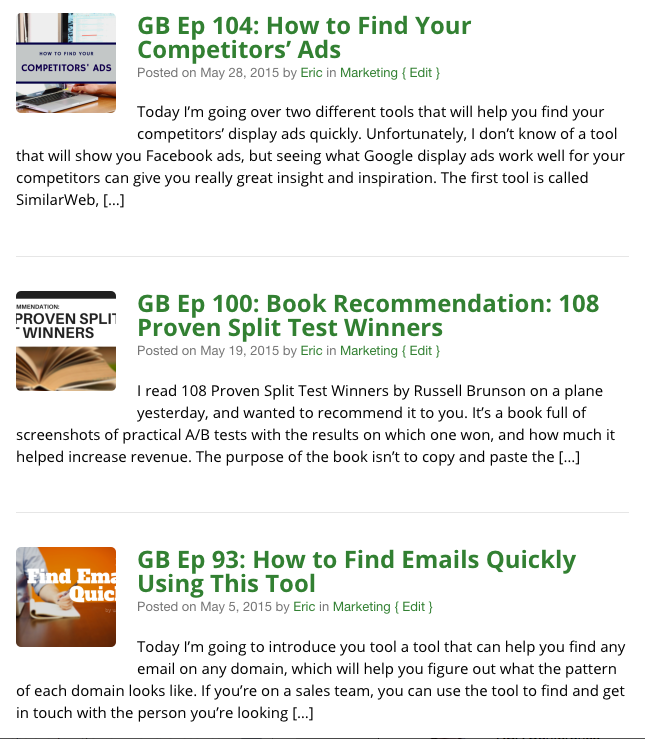 If you’re going to do a daily podcast episode like Marketing School, I recommend that you batch it. Record 10-20 episodes at once. That way you’re ahead and you don’t have to keep frantically pacing all the time. Just stay consistent, I think that’s the biggest thing. There’s a lot of people out there and they get rejected quite a bit. You talk about Peter Diamandis with his X Prize Program that was rejected around 150 times, and Walt Disney’s idea for Disneyland got rejected, and so on and so on. You’ve just got to keep going at it. It’s not like these people are super special or anything like that. It’s just that they kept going at it and had a lot grit. Let me know in the comments below what you’re struggling with so I can figure out how to best serve you!